Which is Healthier: Rare or Well-Done Steak? There’s nothing better than a bloody steak. Or, do you prefer a well-done steak, with not a bit of pink on the inside? Either way, have you ever wondered what the healthier option is? Is there a way to cook your steak that might not cause as many health issues in the long run? 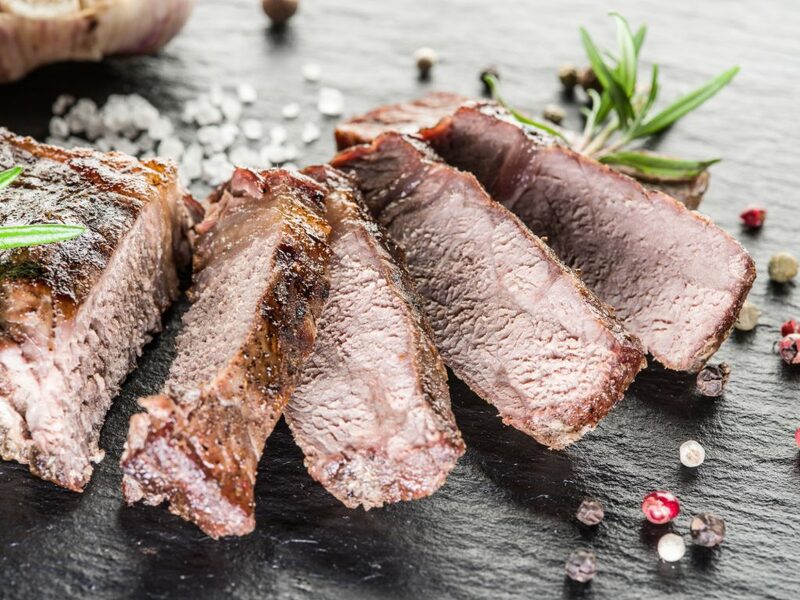 While there will always be a debate on the best way to cook a steak, it’s good to investigate what health ramifications may come from eating beef your preferred way. Keeping an eye on your portions and how much raw or well-cooked meat you eat when going out for dinner is always a good idea. What’s So Dangerous About a Well-Done Steak? There is very little difference in protein content between well-done and rare cooked meat. Ultimately, the dangerous difference between the two is the number of carcinogens that might be lurking in overcooked meat. These carcinogens are actually called heterocyclic amines. Cooking amino acids cause heterocyclic amines. Amino acids are what make muscle mass in animals. These muscles react to heat when cooked. When people eat these carcinogens on a regular basis, they can cause cancerous masses to form in colons. Not exactly a pleasant thought to have while eating a steak. Should You Choose a Rare Steak Though? Since well-cooked meat might be a little bit dangerous in the long run, is it better to eat a bloody steak? Many doctors agree that eating red meat, in general, is dangerous for your health. An increase in red meat intake can lead to heart attacks, strokes, and even cancer. Beef is very calorie rich, which is what makes these threats so concerning. Choosing a steak every time you go to a restaurant may be a bad idea for both your waist and your heart. But like most things, limiting yourself may keep some of the risks at bay. Eating a small-medium rare steak occasionally will not send you into a cardiac arrest most like. Make sure you tell your restaurant server that you don’t want your steak bloody or charred. While making sure you don’t eat too much red meat, there are some things to keep in mind about red meat. A good three ounce, lean steak has 154 calories. This is a decent sized meat portion for a meal. A steak of this size will contain almost half of your daily protein requirement. Each piece of beef will be rich with vitamin B (6 and 12), choline and riboflavin. All these vitamins and minerals are essential for your health. When it comes to finding the right restaurant for your night-out, give our site a look. We list menus of eateries in your location. There are also many coupons or sales to take advantage of. With so many different food options to choose from, take the guesswork out of choosing your next meal with our help! We’ll help you find the perfect well-done steak you crave. We’ll be able to help you find the right restaurant-from vegan menus to traditional fare!